Custom Sash " Order great stoles for students of Tau-Kappa-Epsilon Fraternity"
Tau-Kappa-Epsilon Fraternity or Teke. It was established in 1899, at Illinois Wesleyan University as a college fraternity. Today, Tau-Kappa-Epsilon is one of the largest fraternities in the world. This college fraternity is very popular and has a great deal of chapters on the territory of Canada and the United States. Also, Tau-Kappa-Epsilon Fraternity has a branch in Germany. 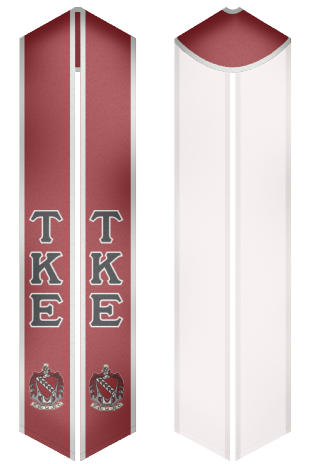 With more than 265,000 members Tau-Kappa-Epsilon remains to be one of the largest social fraternities in North America. 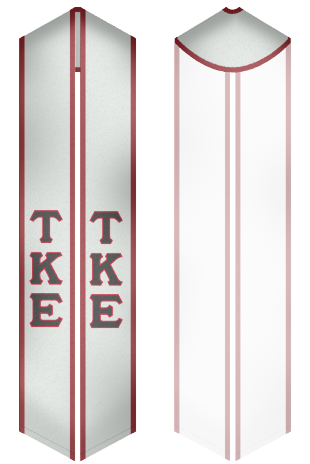 Students of Tau-Kappa-Epsilon Fraternity can order high quality stoles for their graduation ceremony at affordable prices on our website.